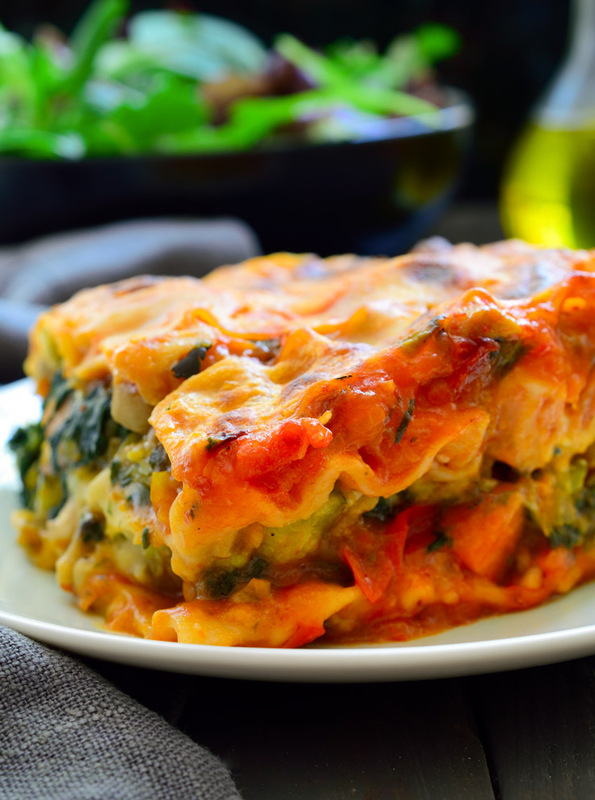 Of all the different ways you can make vegan lasagna, the tofu ricotta one has to be the worst. It’s so gross! It tastes nothing like ricotta and everything like tofu bathed in tomato sauce ! Cashews are a better option for making a cheesy sauce. They’re great for the potato and carrot-based vegan mac and cheese recipes, and I usually use cashews as sour cream. This recipe you’re going to make a veggie-packed filling and a creamy béchamel sauce from scratch. The good new though: they’re both super easy! Heat a large pan over medium-high heat and add 2 tablespoons of the oil, the onion and garlic and fry until soft. Add the mushrooms and fry until browned (work in batches if they don’t all fit in your pan at once). Add the carrot and zucchini and fry a couple more minutes until soft. Finally add the thawed spinach, 1 ½ teaspoons of salt and pepper to taste. Preheat the oven to 200° C / 400° F.
Combine the plant milk and stock in a bowl. Add the remaining 4 tablespoons of oil to a pan over medium heat and sift in the flour. Stir well. Cook for 5 - 10 minutes, stirring from time to time, until the flour begins to brown and gives off a nutty smell. Add one ladleful of the plant milk-stock mixture and whisk really well until evaporated. Continue adding the liquid one ladleful at a time and always stirring until you get a creamy sauce. If you’re unlucky and get some lumps, pass the sauce through a fine mesh strainer. Finally, stir in the nutritional yeast and remaining ½ teaspoon of salt. In a 28 x 18 x 5 cm (11 x 7 x 2 inch) baking pan, place a layer of marinara sauce, followed by a layer of the béchamel, followed by a layer of lasagna noodles (I put the noodles in uncooked) . Then another layer of marinara, half of your veggie filling, the béchamel and more noodles. Continue with more layers. Finish the top with a layer of marinara and a layer of béchamel. Mix them together a bit so that the colour looks more like cheese. Cover with tin foil and bake for 30 minutes. Then uncover and bake for a further 10 minutes, or until the top begins to brown in places and looks like cheese. Remove from the oven and allow to cool for at least 30 minutes before cutting and serving.